Unique CIRCLE OF HEAT® construction means foods are cooked from the side, not the bottom, for more moist cooking results. 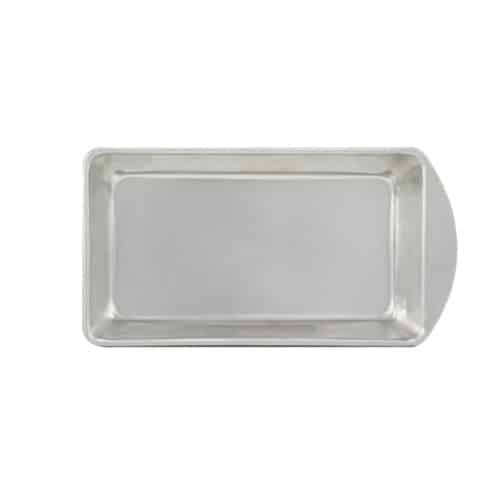 Single chrome steel rack includes handles for safe, easy insertion and removal of hot foods. Automatic temperature control provides a wide range of temperature settings from (200ºF-450ºF) which allow you to slow cook, roast, bake, steam – as well as sear and brown foods. Optional buffet serving kit turns this unit into a portable buffet table, great for serving 3 appetizers or meal items at once. 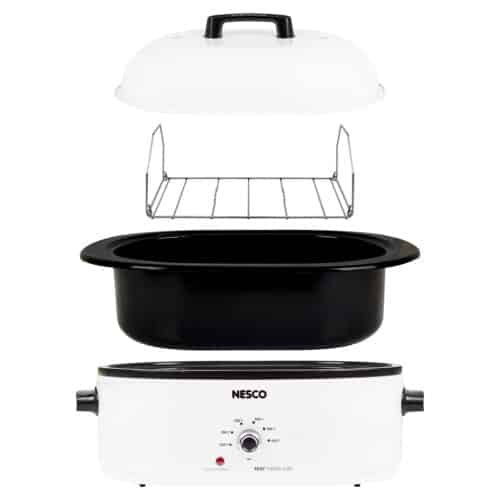 The porcelain coated cookwell is removable and the entire unit is easy to handle, easy to clean, and easy to store. Attractive, informative Use/Care and Recipe Guide. 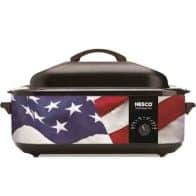 Holds up to a 22# turkey. 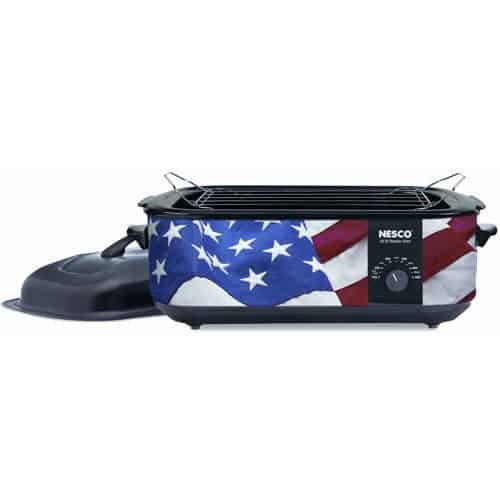 Introducing our new Patriotic (Flag) Design on our Traditional Nesco® Roaster Oven. It’s the one that Grandma used to cook the Thanksgiving turkey, but with a new look. 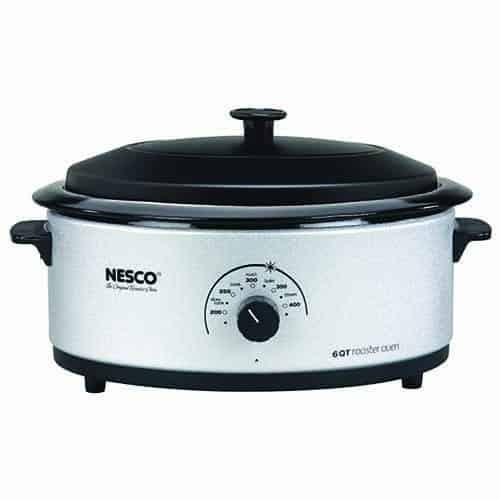 This is one of the most versatile cooking appliances available. It has all the outstanding features of our legendary 18-Quart standard model, at a price customers find hard to resist, and has a new design that will dress up any table. For many, it’s the primary kitchen oven. For others, it’s a secondary oven for the family room, porch, or cabin. It’s portable, so you can take it along for family outings. 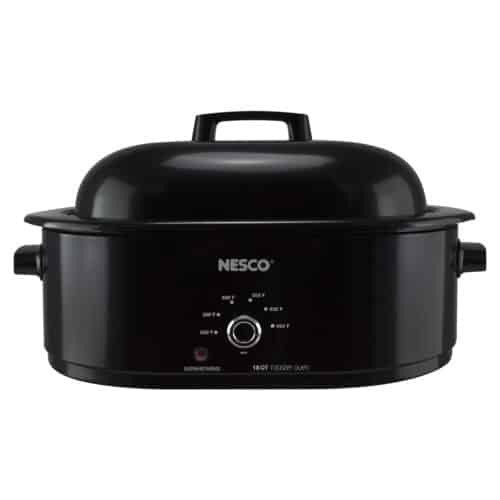 This unit is ideal for large meals and entertaining. 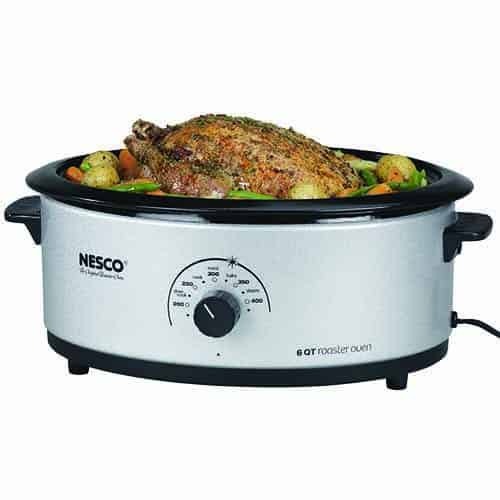 Roast up to 22 pound turkey, pot roast, pork roast, ham, or whole chickens. Bake cookies, cakes, pies, quiche, or whole meals! Cook soups, stews, lasagna, and hot dishes. Make enough chili for the whole gang! Steam/poach vegetables, seafood, and poultry. Slow cooks less tender cuts of meat, too.